While I'm still working on projects for the bazaar, I have taken some time recently to make a few things for myself. The other day I made that Aunty Cookie pouch and a few days ago I whipped up these voile pillow cases. That's right, VOILE! I had originally bought this fabric with the thought of making a dress (maybe like AMH's tunic tutorial), but I've come to realize I need to stick with my strengths, and clothes are simply NOT one of them! ha ha! So I thought I'd indulge myself with some voile pillow cases. One of the projects I've had set aside for myself for a long time has been a queen sized quilt with Little Folks voile on one side and Folksy Flannel on the other. I don't have time to start a new quilt project right now, so I felt that pillow cases could tide me over until I make my fantasy quilt. 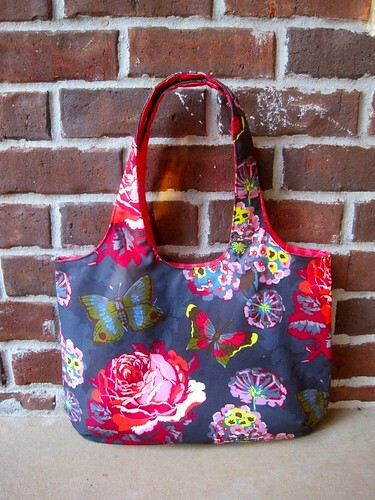 Speaking of AMH, I made this bag (for my upcoming NYC trip) from my favorite Loulouthi print! 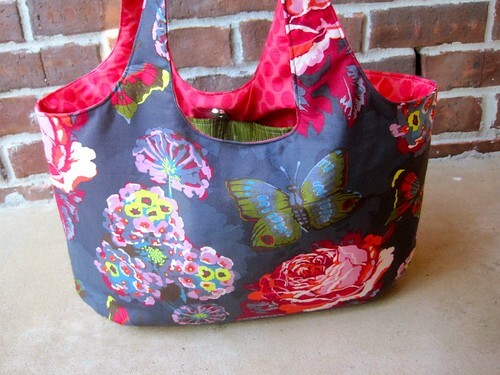 The pattern is from ithinkisew and is called the KELLY bag! Eeep! How perfect! I did modify the pattern some. I used Shape Flex to interface the exterior. I cut muslin the same shape as the exterior and basted it all around. I wanted to give the bag some more weight, but I didn't have enough fusible fleece OR canvas so I had to make do with the muslin. I also added large open pockets to both sides of the bag. I did this by folding down the pattern piece about 1.5" below the marking for the magnetic snap and cutting two pocket piece PER side (so 4 total). In retrospect, I would have made the pockets sit a bit lower, maybe 3-4 inches below the snap. I interfaced one side of each pocket with Decor Bond. I sewed the top of the pocket pieces right sides together, then opened the piece to place wrong sides together and topstitched the top portion. Repeated for the other piece. Next I placed the pockets on the interior pieces and sewed a line up the middle of the pocket pieces, creating two large open pocket per side (so 4 pockets total). You can make the pockets any size you want depending on where you sew. Then I basted the pocket pieces to the lining pieces and sewed according to the pattern. 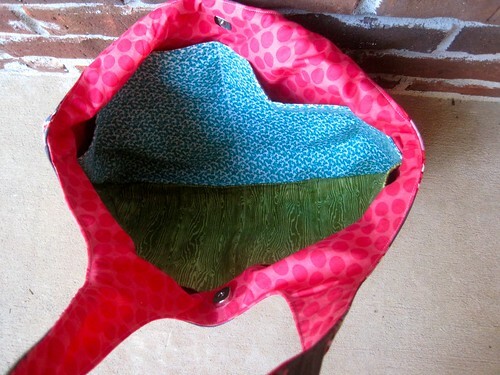 The interior is made with fabric from It's a Hoot, Just Wing It, and Aviary 2. This pattern is SUPER simple and I highly recommend it! what a great pattern to display that beautiful fabric!! 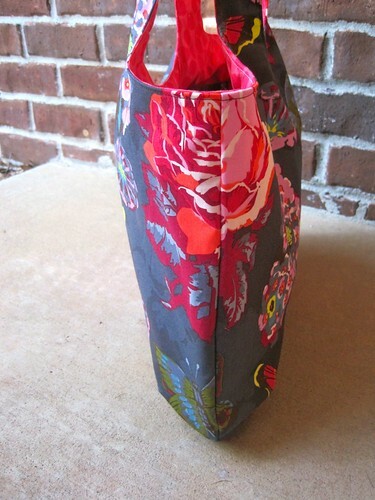 I've been thinking it's time to sew a fall/winter bag & this looks perfect! And I can't imagine how gorgeous those pillowcases feel!! Lucky you! very cute bag! and voile pillocases, genious! i bet is heavenly! 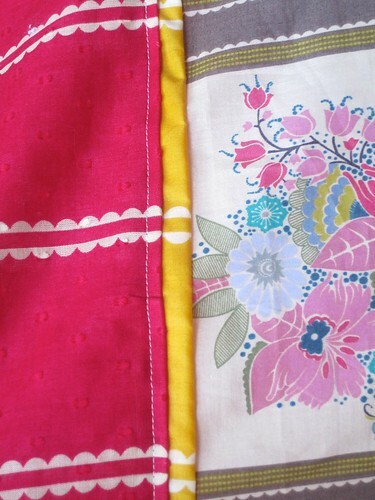 Love your selfish sewing - those are the coolest pillow cases I've seen in a long time, and the Loulouthi is fabulous. Selfish sewing is the best, sometimes. And you deserve it! Your new bag and pillowcases are lovely. I've got some voile I intended for a garment, and I may have to face the same facts! a little selfish sewing is in order sometimes! LOVE that bag. I just got the same fabric for my diaper bag. Seeing your gorgeous bag I can't wait to get to work! Ooh, I want some voile pillowcases! Yours are lovely! Fantastic bag too. I love that bag! I've been messing around all summer, trying to find a good bag pattern, but I'm still not 100% satisfied. Maybe I will try this one out. Great fabric choice, too! 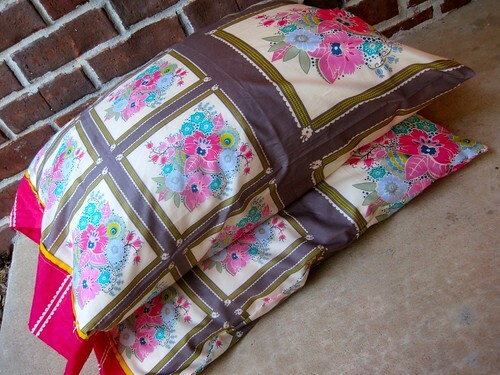 Gorgeous pillows but i love that bag - the style is great and the fabric is just lovely! Gimmeeee!!! Those voile pillows are to die for!! And the bag is adorable! I bet I would sleep a million times better with those pillow cases! I LOVE your new bag!!! Great work! Love the idea of the voile and flannel pillowcases, and the bag is divine. Off to check out the pattern! Enjoy your NYC trip. Only a little bit jealous. That bag is adorable and those pillow cases are great... I bet they are super soft and yummy! I make new pillowcases all the time when I need a quick sewing fix - haven't tried voile yet though. LOVE this bag and adding the pockets was just genius! The best part? I already own that pattern AND fabric, yay! NYC: Food, Fabric, and Fabulous!